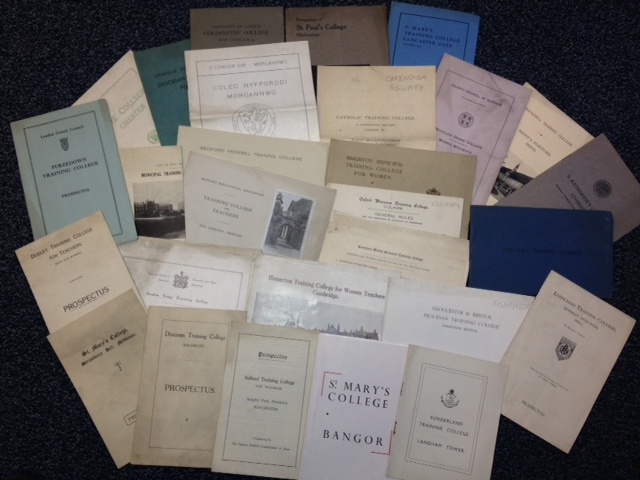 I came back to work from a short break to find a newly deposited collection on my desk – the collection of prospectuses dating from the 1930s from various Teacher Training Colleges which were part of the British and Foreign School Society Collection at Brunel University Archives. There are 45 prospectuses and general information leaflets in this collection and they represent teacher training colleges all over the country. A quick search on the catalogue shows that we have very few prospectuses for the various teacher training colleges so this is a welcome addition. Hockerill Training College, Bishop’s Stortford, Herts. Homerton Training College for Women Teachers, Cambridge. This entry was posted in Special Collections and tagged Historical Collections, history of education, prospectuses, research, special collections, teacher training. Bookmark the permalink. Is there any chance of obtaining a copy of the Norwich Training College Prospectus? I will obviously pay for the copy and any cost associated with posting. Many thanks. Hello Kim, I can scan a copy of the prospectus and send it to you. Please confirm your email address by writing to me at n.bhimani@ioe.ac.uk Thanks! Hi My Mother is now 79 yrs and went to the Hull Municipal Training Teachers College during the early 1950s , I am travelling up To Hull today on business for a few days and have been asked by my Mother to check our the site at Cottingham Rd, although we know it is no longer in use for teaching training, is there any chance of getting a prospectus for the early 1950s, Mum had very happy memories of her time in Hull and kept in touch with one of her tutors until the 1990s. Please can you tell me what year is the Brighton Municipal Training College for Women prospectus? I am just compiling a 50th wedding anniversary album for my parents who were at St Mary’s and St Paul’s teacher training colleges (in ’64 and ’65 I imagine), and I myself was at Homerton – would it please be possible to see copies of these three documents from your list? Hi, I’m interested in finding out more about the prospectus you have for Gloucester & Bristol Diocesan Training College, Fishponds, Bristol. My great aunt was on the teaching staff there from 1909 until about 1930. Thanks for your help. I’d be very grateful for a scan of the Kenton Lodge College prospectus, if possible. My mother and her future sister-in-law were students there in the 1930s. Hello,I would be interested in St. Katherine’s Training College Report for the years 1939-40, as I am researching my family history. I wonder whether you could kindly scan the report and send it to my email address. I am helping to compile a 60th birthday book of memories for a friend. Would it be possible to scan a copy of the Neville’s Cross College prospectus; we both attend the college from 1970- 75 as trainee teachers? Hi, my wife and myself were students at Dudley Teacher Training College. Is there a chance of obtaining a copy of your Dudley prospectus so I can make it available via Friends Reunited? Hi John, We have photographed the prospectus and I am happy for you to have a copy but I would prefer for the copy not to be shared on Friends Reunited. If there are others that would be interested, please ask them to contact us. My mother who is now 96 was at the Catholic Training College, Cavendish Square, London (1936-1939) and I trained at St Marys College, Strawberry Hill. Any chance of having copies of these prospectuses? I would love to show both of them to my mother, she’d be thrilled! Hi, I see you have nothing from Avery Hill Teacher Training College, Eltham, LONDON (1906-1985). Would you like me to see whether we have any spare, or would this corrupts the Fonds? I believe there was a training college for domestic science in the Leicester area during the early 1930s. Is it possible that this was the one you have listed as “East Midlands Training College, Loughborough College, Leicestershire” ? I wonder if you could please send me a scanned copy of this prospectus so that I could check some details? Please could you tell me how much it will be to obtain a copy of the Endsleigh catalogue ?